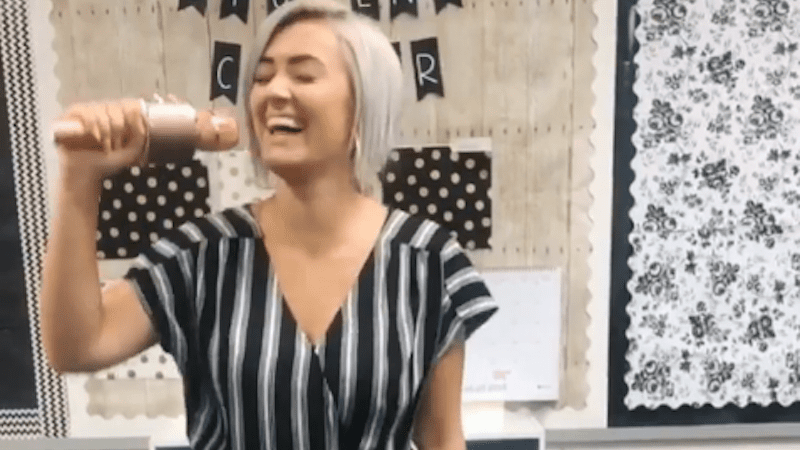 Lately we’ve been hearing a lot of buzz on social media about teachers loving their karaoke microphones! For most kids, using a microphone in class is about as fun as it gets. But there are plenty of other benefits, too. Microphones can help promote language articulation, develop public speaking skills, and provide an incentive for active participation. Here are 15 fun ways teachers are using microphones in the classroom. Psst…looking for your own karaoke microphone? We like this one on Amazon (#affiliate link). 1. Turn morning meeting into an opportunity to shine. Build your students’ confidence by having them take turns going over the daily calendar, schedule, and weather report in front of the class. Put a microphone in their hand to take it from routine task to diva performance. Hold a practice spelling bee in class to help your students overcome any onstage anxiety. 3. Reward your students for good behavior. We all have those students who love to be the center of attention. Use the microphone as an incentive for good behavior. After meeting a goal of focused learning, give them the opportunity to be in the spotlight by telling a joke, posing a brain teaser, or reading a poem. 4. Take readers’ theater up a notch. Readers’ theater is such a great way to make stories come alive for students. But we’ve all witnessed performances with mumbly voices and hard-to-understand lines. Using a microphone ups audience engagement and makes readers feel like star performers. 5. Have students try their hand at being a roving reporter. Use a microphone and an iPad to record news segments. Collect students’ opinions about a current issue, such as what the next class reward should be. This is also great for story retelling, concept review, and clarifying procedures. 6. Go in depth with one-on-one interviews. If you have career day in your classroom, have your students prepare questions and then use the microphone while interviewing the guests. For a biography project, have your students interview one another, taking turns posing as the research subject. Or conduct interviews with students posing as book characters from the class’s most recent read aloud. 7. Build classroom community with sing-alongs. Music brings people together, and this is especially true for kids. Create a playlist of favorite songs that define your classroom community—from old time favorites to learning songs, like the classic “50 Nifty United States.” For ways to introduce your students to great American music, download this free poster. 8. Turn review into a game show! Reviewing concepts in game show format is way more fun than reviewing worksheets or taking notes on note cards. Why not play game show host and turn key concepts into a version of Family Feud? Or put students in the hot seat with a classroom version of Pyramid. Read here for more game show ideas. 9. Give your students a shot of courage for their solos. Singing in a group is one thing, but taking center stage for a solo? That’s a whole other ball game. Add a microphone, and your students will be inspired to tap into their inner rock star. 10. Save your teacher voice. Tired of having to raise your voice to be heard? Pull out the microphone and voila! Instant engagement. For added effect, use the echo feature! 11. And help shy students find theirs. Encourage shy little ones with soft voices to speak up with the help of a microphone. 12. Hold a poetry slam. Let your students choose a song that represents the tone of their poem and play it softly in the background as they perform their original work. 13. Celebrate your classroom authors. Let your students take center stage and read their stories into the microphone to honor and share their writing. This is especially great when there are special people (parents, admin, other students and teachers) in the audience. 14. Get creative with vocabulary practice. Challenge students to create and perform a jingle that features their vocabulary words. Setting new words to music always helps with retention. 15. Keep things running on schedule. Each day, assign one student to be the transition monitor, allowing them to use the microphone to inform the class when it’s time to clean up, to remind students what materials to get out for the next period, to signal groups to line up, etc. How do you use microphones in the classroom? Come share your ideas on our WeAreTeachers HELPLINEgroup on Facebook. Also, check out 5 Strategies to Use With Your Squirmiest, Wiggliest Students.